Part of Urban Infill Art In The Core; empty+active spaces in the downtown will be converted into arts/cultural spaces with over 350 artists converging to exhibit their art for one of the largest multi-disciplinary art shows in the City of Thunder Bay. 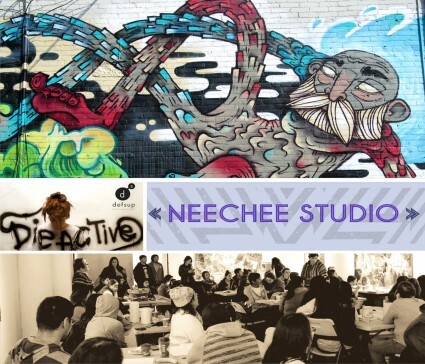 DefSup’s Die Active Art Collective, Neechee Studio and inVISIBLE Ink (LGBTQQ2S Youth) represents one aspect of some 24 projects in the core, spaces generously donated and located the Tomlinson Block (Red River and Cumberland) + McKitrick Law Firm- Callon Bldg. (17+19 S. Cumberland St.). Over 5,000 sq.ft. of new exhibition space. Join us for a Gala Opening Reception at Definitely Superior Art Gallery Sat.April 9, 7-11pm with three new exhibitions featuring national/international artists. Part of the downtown wide Urban Infill exhibitions and a ferocity of Art/Music/Dance+Wearable Art. Catering by Sushi Bowl+Sweet Escape Cake Café & Bakery. Pick up your map at DefSup and then follow the Tour Guides to all the exciting Urban Infill locations, re-discover your Downtown Waterfront District through art & culture. Shows will continue to run Sun. Apr. 10-12th, 12-6pm.